The Neosonic Behind the Ear Hearing Amplifier is one of the latest mid-range amplifiers that is generating great reviews and good user feedback on Amazon over the last few months. Introduced in early 2018, this very reasonably priced device has a lot of features that you usually find only on much more expensive amplifiers like more advanced noise suppression technology, 4 different listening programs, as well as feedback and background noise canceling technology. This device costs roughly $150 but has features that are similar to $300 devices. You can wear it in both ears. Neosonic Technology is a relatively new company that is getting into the hearing amplifier business. Currently, they have four models including a couple of BTE styles and a mini RIC (receiver in the ear) device. This device is the Neosonic’s most powerful amplifier and recommended for mild to severe hearing loss. Reviews indicate that this amplifier is comfortable and easy to wear with glasses with no issue whatsoever. If you are new to wearing a hearing device, it may take a few days to get used to, but it is reportedly lightweight and easy to wear. This device can be worn in either ear, and it comes with three different size ear domes so you can make sure you get the right fit, which is super important for comfort as well as sound quality. Since this BTE model has some of the higher-end sound processing technology that is used in more expensive units, most users seem to agree that the sound quality is quite good. The decibel level of this Neosonic BTE is a gain of 57db, which is pretty high for an over-the-counter amplifier, making it a good choice if you have severe hearing loss and are unable to purchase a hearing aid. There aren’t very many amplifiers that are this powerful in this price range. The Neosonic BTE comes with an excellent 45-day money back guarantee and a 12-month manufacturers warranty. One thing that looks promising about the Neosonic company is that they have a great, informative website with their social channels all listed and easy to find. The site is full of info about the products and how to get in touch with support. Most reviews indicate that customer service is speedy and terrific. Many of the hearing amplifiers brands that sell through Amazon don’t have the best support and can be challenging to get in touch with if you run into issues. That does not appear to be the case with Neosonic. What looks great about this device is the four channels that allows you to customize the sound based on the setting that you are in (normal, noisy, outdoor or meeting). It is important because different sound processing technology needs to be used in different settings. For example, if you are in a restaurant, you need to have strong background noise canceling technology to allow you to hear the voices closest to you. If you are outside and it is windy, you will also want feedback reduction technology that will stop or cut down on the whistling that may occur in the amplifier. 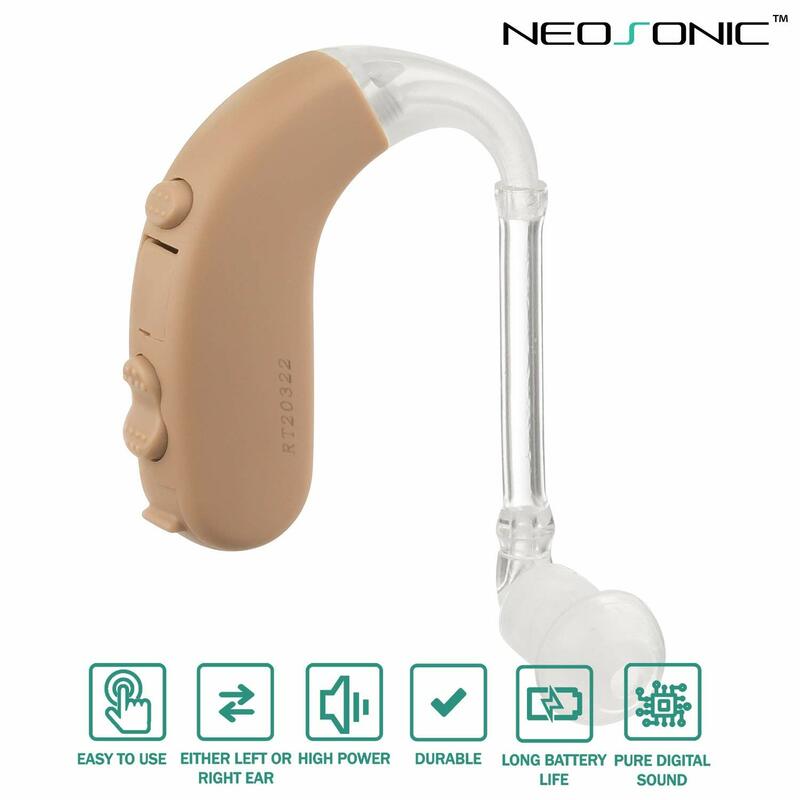 The Neosonic Hearing Amplifier BTE has a great battery life of about 10 days. It uses size 13 zinc-air batteries, which are a fairly common hearing aid battery that is easy to buy or order online. This new BTE amplifier looks very promising as a great option if you want a good quality device, at a very good price. It is about half the price of some of the very popular and successful amplifiers like the Empower or the Otofonix Encore that a lot of people are finding work quite well as a low-cost hearing aid replacement. This amplifier will give you a high level of amplification if you have severe hearing loss without the high price tag. The company return policy also gives you enough time to try out this device just to make sure it is right for you.